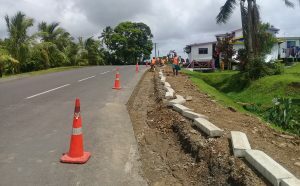 Residents in Cunningham in the Central Division will soon see new footpaths being constructed as part of Fiji Roads Authority’s (FRA) Renewals Project. FRA Chief Executive Officer John Hutchinson says that Rehoboth Infrastructure Limited has been awarded the contract to construct new footpaths with the sum of $1,320,261.61. “Cunningham Road currently lacks footpath. The new footpaths will increase safety and reduce car and pedestrian accidents,” Mr Hutchinson said. He said the scope of works includes new footpaths, associated kerb and channel, drainage, signage and pedestrian hand rails. Mr Hutchinson said the FRA will ensure that all works carried out on site will be done with minimum impact upon the environment and residents.